This post is for you brownie enthusiasts who have too many brownie recipes already but are always glad to have another. That’s where I fall on the spectrum. But what’s weird is lately I get the feeling that brownies aren’t as popular here in Chicago as they are in Austin. People like them (I did get some nice compliments on the Cape Town Brownies), but for the most part chocolate chip cookies are more well received. Or maybe it’s my imagination. Whatever the case, these Moosewood Brownies (a recipe from the famous New York restaurant) are very good. 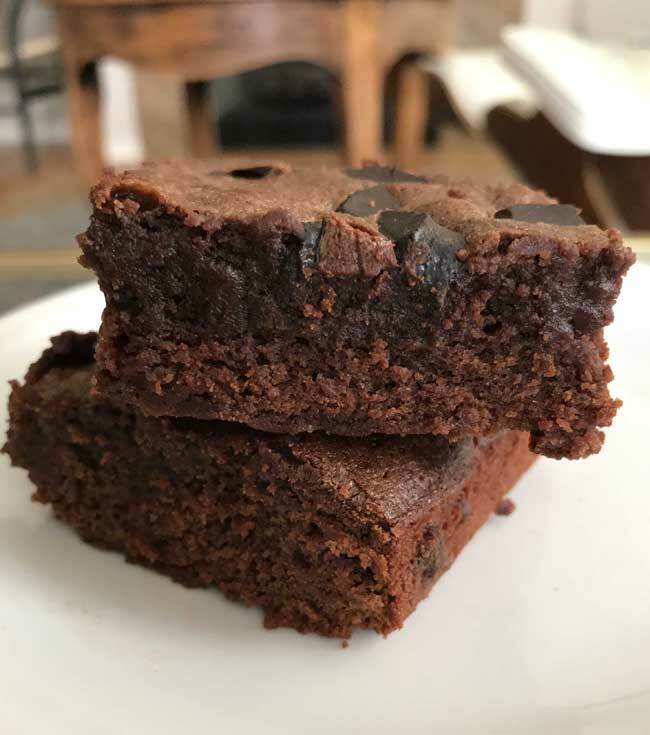 From what I’ve read, Moosewood Brownies have had quite a following over the years at the restaurant and with home bakers. They are are made with unsweetened chocolate, light brown sugar and pastry flour. Unfortunately (or maybe fortunately?) I was out of pastry flour and had to use cake flour. The cake flour worked quite nicely and the brownies had a velvet-y texture. They are most definitely fudge-y, but I can see how they might turn out cakier if one were to use all-purpose flour, so I recommend sticking with cake or pastry flour. Here’s a picture of the texture. If you make them, I’d love to know what you think! 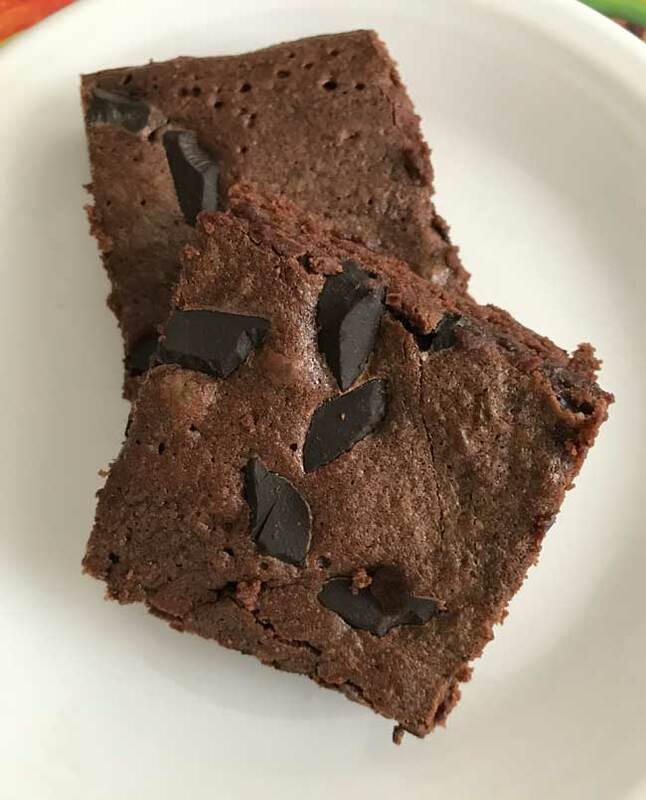 Moosewood Fudge Brownies are made with pastry flour (or cake flour), brown sugar and unsweetened chocolate. 1/2 cup chocolate chunks of chocolate chips. Preheat oven to 350 degrees F. Line a 9x13 inch metal pan with foil and grease bottom only. In a saucepan or in a microwave-safe bowl, melt the butter. Add the chopped chocolate to the hot melted butter and stir until fully melted. If using the microwave, you may have to microwave it a bit more, stirring every 15 seconds, until melted and smooth. Set aside to cool slightly. In a mixing bowl, combine the salt (if using), brown sugar and vanilla. Add the melted chocolate mixture and stir by hand (if using a stand mixer, use the paddle attachment on low) until blended. Gradually add the eggs, stirring until blended. Lastly, stir in the flour until fully blended. Pour mixture into prepared pan. If desired, sprinkle chocolate chips or chunks over the top. Bake for 25-30 minutes (though check at 20) or until brownies appear set. Let cool at room temperature or quick cool by putting the 9x13 inch pan in a larger roasting pan and filling 2/3 up the sides with ice water. When brownies are completely cool, lift from pan and cut into 24 bars. Thanks Amanda! I didn’t give this one much of a spin other than to use cake flour and chocolate chunks, but I’ll take the compliment! I hope you try the brownies :). Way to jazz up a recipe, Anna! I love your creativity and once again, you amaze me with the different spin you give to the delicious brownie. There can never be enough brownie recipes and I never heard of this one from Moosewood. Thanks for sharing the yumminess. It definitely looks like something I would love to try.